Marine Biologist Rob Carter explains the four-dimensional genome and what this means for design. The latest evidence on the four dimensional genome, which includes dynamic programming, makes intelligent design the only possible explanation for its existence. Evolution by random chance is nonsense. Listen to the excitement in Rob’s voice as he explains the amazing complexity of the four dimensional genome. The level of design is “mind blowing”. It can only make you think how amazing is our God. He is worthy of our praise and adoration. Why does academia, the establishment, reject intelligent design and all that entails? There is only one possible answer: they cannot countenance God, their creator and all that entails. Recent reports on the human genome provide powerful support for the Biblical history of Creation and The Fall. 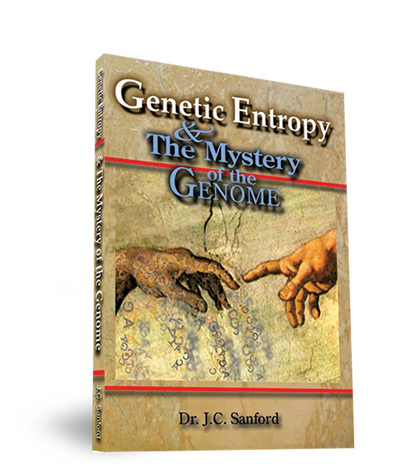 In his landmark book Genetic Entropy & The Mystery of the Genome, geneticist Dr John Sanford clearly demonstrates that human genomes are decaying at an unstoppable rate. Dr Sanford became famous back in the seventies when he jointly invented the “Gene Gun” which enabled scientists to genetically modify fruit and vegetables. An even more important development occurred with Sanford and colleagues release of a powerful computer simulation programme Mendel’s Accountant. It allows greater refinement in predicting the fate of mutations in populations and the results agree with Sanford’s earlier work. There are no realistic evolutionary models in the scientific literature that contradict these results. This overwhelming negative evidence clearly contradicts Darwinian expectations, but clearly and dramatically fits the Biblical record of Creation and The Fall. This article was extracted from a paper in Journal of Creation Vol 28 (1) 2014: Human genome decay and the origin of life by Alex Williams. 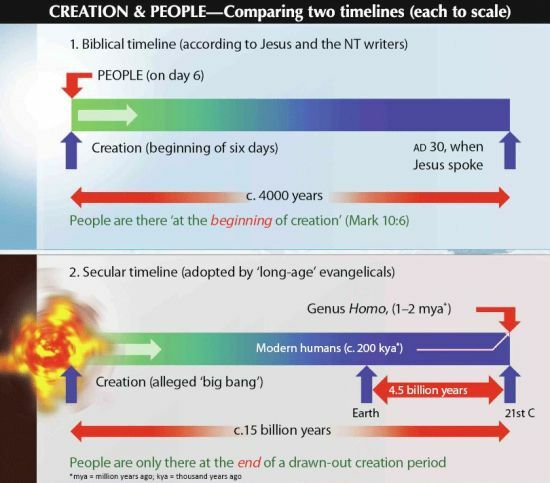 The Bible is God’s WORD and it clearly reveals the correct Timeline for this universe which differs so radically from the Secular Timeline of billions of years. 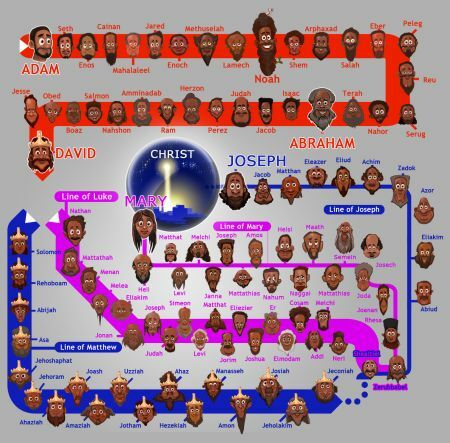 We know Jesus implicitly believed the Old Testament as true history as revealed in the chronogenealogies and He specifically says in Mark 10:6 that Adam and Eve were there at the beginning of Creation (Day 6). “But from the beginning of creation, God made them male and female”. Recent reports on the human genome provide powerful support for the biblical history of Creation and Fall. We are unable to reproduce ourselves without making multiple copying errors every generation. As a result our genomes are decaying towards extinction from copy errors alone. There are many other causes for mutations. In his landmark book Genetic Entropy and the Mystery of the Genome, Geneticist Dr John Sanford clearly demonstrates that human genomes are decaying at an unstoppable rate. More recently Dr Sanford and colleagues have confirmed his predictions with a powerful computer simulation programme Mendel’s Accountant. The Model predicts our species will become extinct in about 300 generations (6,000 years, with a generation time of 20 years). The only kind of genome copying system that can sustain life over thousands of years is one that has two primary characteristics. First it must be precisely engineered so that it began without making copying mistakes. Second it must be protected and maintained in such away that it is at least partly insulated from the general genome decay that is rapidly going on around it. These characteristics fit very well into the Biblical account of Creation and Fall just a few thousand years ago, but are impossible from a Darwinian starting point. It is amazing that the Mendel Accountant Model simply projected backwards comes up with perfect copy fidelity at around 4,000 years BC. The Darwinian claim – that life could have started with low fidelity self-replicating molecules – is exposed as culpable foolishness. The ‘RNA world’ scenario collapses into ‘error catastrophe’ so quickly it is scandalous that such nonsense is taught as a realistic model of origin in our schools and universities. This information was extracted from an article by Alex Williams, Human Genome Decay and the Origin of Life. Journal of Creation 28 (1) 2014. Pictured is Dr Ignaz Semmelweis. He struggled against the scientific consensus of his day. The cost of ignoring his research findings was the loss of countless lives and much suffering. Sadly consensus science has a poor record. In fact the task of science has nothing to do with consensus. Consensus is the business of politics. Science on the contrary requires only one investigator who happens to be right. Dr Ignaz Semmelweiss, a Hungarian surgeon, was one of those investigators who was right. He discovered that ‘childbed fever’ which typically caused a ten to thirty percent mortality level, could largely be abolished if doctors simply washed their hands in a chlorine solution before examining pregnant mothers. The compelling evidence however failed to impress his superiors and he was eventually dismissed from the clinic even though the mortality rate for his patients was essentially zero. Semmelweis’s procedure went contrary to the whole theory of medical consensus existing in his day. He spent the last years of his life unsuccessfully trying to convince European doctors of his systems effectiveness. He ended his life in a mental hospital and his ideas forgotten until Dr Joseph Lister took up the battle this time successfully. The story of Dr Alexander Gordon of Aberdeen is much the same. In 1795 he suggested that the fevers which were the number one killer of women following childbirth were an infectious process and he was able to prevent/cure them. The consensus said NO…. Thus the consensus took one hundred and twenty five years to arrive at the right/same conclusion. These are but two of many examples of scientists resistance to accepting the truth when it conflicts with accepted dogma. Evolution is also an entrenched dogma despite the overwhelming evidence for amazing design of life and the universe. Since the discovery of the complexity of DNA (ENCODE PROJECT) and sub-microscopic cell machinery of irreducible complexity there is a growing number of eminent scientists embracing intelligent design. Why the establishment is so wedded to materialism and evolutionary naturalism is perhaps best explained by Professor Richard Lewontin, a geneticist and probably one of the world’s leaders in promoting evolutionary biology. Evolution sheds no light on the beginning of the Universe and life. It postulates matter, energy and time brought this beautiful orderly Cosmos into being, with its intricate life forms, its complex natural laws, its intangible moral qualities and the creative and reasoning powers of man. Even Aristotle and Plato knew this speaks of infinite intelligence and yet evolution insists blind chance can account for it all. At a foundational level we are involved in a battle of world views. Christians know God, so the idea that matter and energy and blind chance can produce the Cosmos we inhabit is absurd. Almost all the early transgenic crops were transformed with the gene gun – especially corn and soybeans. Dr John Sanford, a former Cornell University Professor, is well known in genetic engineering circles as the co-inventor of the ‘gene gun’ approach to genetic engineering of plants. This technology has had a major impact on agriculture around the world. For Christians, Dr Sanford is a prime example of how the third person of the Trinity, the Holy Spirit transforms our lives as we submit to the Lordship of Jesus Christ. Christianity is not a democracy it’s a Kingdom. Jesus taught us to pray to our Heavenly Father, “Your Kingdom come, your will be done on earth as it is in heaven”. See what Dr Sanford has to say, “I came to believe in God but this still did not significantly change my intellectual outlook on origins. I accepted evolution. However thankfully, the Holy Spirit transformed my mind as I submitted to the Lordship of Jesus Christ. This included how I viewed science and history. I would not say science led me to the Lord which is the experience of some. Rather, I would just say that the Holy Spirit opened my eyes to see God as creator – I was blind and gradually I could see. On a personal level, this was a time of spiritual awakening, but professionally I remained ‘in the closet’. I felt the need to take a temporary leave from academia and institutional science because of the tension and enormous hostility I sensed from my academic colleagues. In the current intellectual climate to reject evolutionary theory has the appearance of rejecting science itself. This is totally upside down”. Professor Sanford is back and he considers that whilst his ‘gene gun’ success was a special blessing, it only paved the way for his current work “which I consider much more important”. His ground breaking book GENETIC ENTROPY and the MYSTERY of the GENOME traces the history of human genetic decline due to mutations in our DNA. The evidence is startling because it refutes conventional dates for alleged human evolution. All of the problems with evolutionary theory as outlined in GENETIC ENTROPY and the MYSTERY of the GENOME have now been rigorously proven using numerical simulation by scientists, Dr John Baumgardner, Dr Wesley Brewer, Dr Paul Gibson and Walter ReMine M.S using ‘Mendel’s Accountant’, a state of the art computer analytical tool for genetic systems which they had developed. 1. Mutations arise faster than selection can eliminate them. 2. Mutations are overwhelmingly too subtle to be selectable. 3.”Biological noise” and “survival of the luckiest” overwhelm selection. 4. Bad mutations are physically linked to good mutations, so they cannot be separated in inheritance. The result is that all higher genomes degenerate. Genetic Entropy is no doubt the underlying mechanism explaining the extinction process (mutation accumulation). These findings have been widely reported and Mendel’s Accountant is available for free download to assist any scientist interested in furthering knowledge in this field. Dr Sanford’s second book outlining these findings “Genetic Entropy and Mendel’s Accountant is expected to be published shortly.